SANTIAGO, Jun 28 2012 (IPS) - The model of exploiting fisheries that has prevailed in the last decade has driven fish stocks to critically low levels in Chile, which has a 6,435 km Pacific coastline and a wide diversity of marine resources. A report by the Marine Conservation Programme of the Chilean chapter of the World Wild Fund for Nature (WWF-Chile) indicated that 64 percent of the 22 fisheries in the country that have catch quotas are biologically overexploited, a figure that is in line with official statistics. 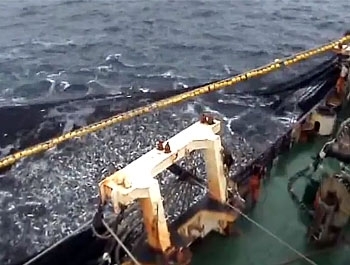 The Chilean fisheries authority regulates industrial extraction of specified marine resources in defined coastal areas. The report adds that, out of 148 fishery resources landed in 2009, only 20 have been assessed for their biological condition or exploitation status. Therefore nothing is known about the status of 86 percent of national fishery resources, representing 30 percent of the total catch. Q&A: "There’s a Limit to Fish Harvesting"
In Chile, 92 percent of extracted marine resources are fish, five percent are algae or kelp, and the remaining three percent are shellfish. Extractive fishing contributed 0.4 percent of GDP in 2011 and exports of farmed and wild fish earned over 4.88 billion dollars that year. “The fisheries crisis has worsened in the last 10 years, and the model that allowed the setting of catch quotas higher than scientific recommendations is what has created the situation we are in today,” Samuel Leiva, a campaign coordinator with the Chilean branch of global environmental watchdog Greenpeace, told IPS. According to a report by the Centre for Investigative Journalism (CIPER), nine industrial fishing companies take 90 percent of Chilean jack mackerel (Trachurus murphyi), sardine and anchovy, the three main species caught in the country. The business is worth over 1.2 billion dollars a year. “The big debate nowadays is over who gets to fish. But at Greenpeace we are also very concerned because these resources no longer exist, they are in crisis or they are overexploited, and plans must be made, at the national and international levels, for the recovery of fisheries,” Leiva said. “Every possible effort must be made to manage fisheries in a precautionary manner, with an ecosystems approach, as this is precisely what is needed for their recovery,” he said. To this end, Congress is debating the new Fisheries Law, which will be in effect for 20 years, as of January 2013. According to Economy Minister Pablo Longueira, the new law is necessary because it sets goals for sustainability, regulation and oversight of the fisheries, and for scientific management and decisions for fisheries administration. “The government is pursuing measures that choke artisanal fishing, such as mandatory installation of satellite tracking on our fishing boats,” complained Jorge Bustos, spokesman for the National Committee for the Defence of Artisanal Fisheries (CNDPA), which represents more than 55,000 fishermen and fisherwomen. “This is just a big racket. If we can’t afford to eat, how does Longueira expect us to be able to afford his demands?” he said. Bustos said small-scale fishers want an end to trawl fishing; better distribution of catch quotas with greater equality for the artisanal sector; extension of the five-nautical-mile zone, reserved exclusively for artisanal fishers, to the entire Chilean coastline; and greater environmental sustainability. Leiva blamed the governments of the last decade for their short-term outlook. “In 2001-2002, when the current fisheries law that the government now proposes to change was implemented, Chilean fisheries were not in a critical state,” said the activist. “But over the last 10 years, fisheries have been overexploited with total disregard for scientific recommendations. This model did not effectively regulate fisheries, as originally promised,” he said. In spite of the critical situation, environmental organisations celebrated the Chilean Senate’s ratification on Jun. 13 of the Convention on the Conservation and Management of High Seas Fishery Resources in the South Pacific Ocean. The international convention, adopted in New Zealand in 2009, provides for the creation of a South Pacific Regional Fisheries Management Organisation (SPRFMO). The convention, which has not yet entered into force, regulates trans-zonal fisheries (involving fish stocks that occupy the exclusive economic zones of more than one country, which compete for the catch) and fishing on the high seas, as well as affording a framework for coastal states and non-coastal states to reach agreement on administration and conservation measures. The fisheries under-secretary, Pablo Galilea, said the Senate approval opened the doors to Chile’s ratification of the convention, and its entry into force. To date, of the 32 member states of the SPRFMO, nine have ratified the convention, and 30 days after Chile’s official ratification is complete, the convention can enter into force. Galilea stressed that the Chilean jack mackerel (a trans-zonal fish) is one of the country’s main fish species, and its population is presently in a state of collapse, so that any and every measure that can be adopted to avoid indiscriminate fishing of this species will help preserve it for future generations. In Leiva’s view, a point of particular importance in the convention is that all catch quotas in the South Pacific, whether within territorial waters or not, will be subject to strict multilateral scientific monitoring. “This is essential for the recovery and regulation of fisheries everywhere in the South Pacific,” he said. The SPRFMO Commission will hold its first official session in January 2013, when it will begin to adopt binding and mandatory measures for the administration of trans-zonal fisheries in the South Pacific, which will mainly benefit the jack mackerel.